Shortly after being named WSOP Dealer of the Year during the opening ceremonies, Ashley McCoach takes her seat at the table to work on Day 1b of the WSOP Main Event. Ashley McCoach was named the WSOP Dealer of the Year, and got to say the famous opening phrase, "Shuffle up and deal" on Day 1b of the WSOP Main Event. 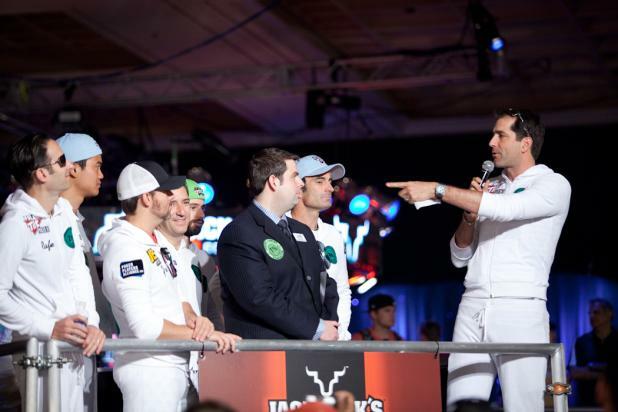 On Day 1b of the WSOP Main Event, Tournament Director Jack Effel takes a moment to honor the dealers that make the World Series of Poker possible. Phil Gordon and some of his professional poker player friends are wearing white track suits to show their support for the Bad Beat on Cancer charity. Gordon hopes that all players will pledge 1% of their WSOP winnings to support cancer research. In the past nine years, the charity has raised more than $3.3 million. 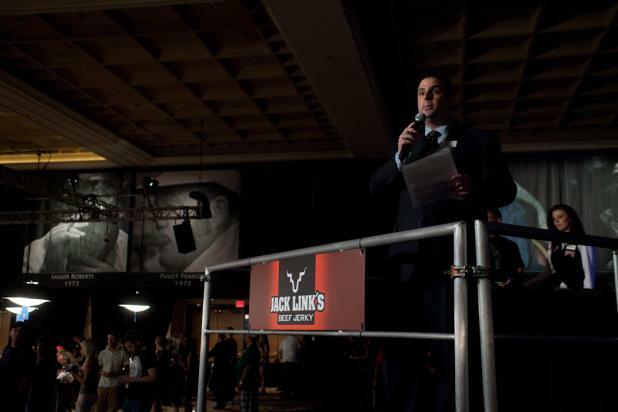 WSOP Tournament Director Jack Effel welcomes the players to Day 1b of the WSOP Main Event. Another 1,489 players started the tournament today, bringing the two-day total to 2,614. There are two more starting days ahead (Wednesday and Thursday), and the later days usually attract more players. 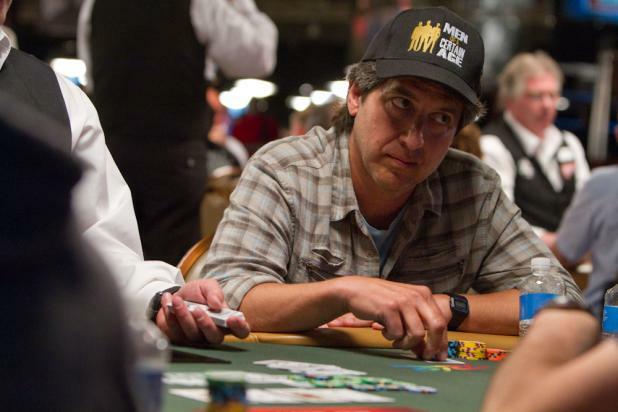 Actor Ray Romano, most famous for his sit-com "Everybody Loves Raymond," plays on Day 1a of the WSOP Main Event. Romano has been playing in the WSOP for the last several years along with his co-star Brad Garrett. Romano's hat is from his latest TV show, a one-hour comedy-drama called "Men of a Certain Age." The first thing players at Lacey Jones' table notice is her stunning good looks. It takes them a little while longer to realize that she also knows her way around a poker table -- in addition to hold'em, Jones plays all five games of H.O.R.S.E. Jones surprised her opponents when she chipped up in the early levels of the WSOP Main Event on Day 1a, and was among the top 10 chip counts during the first two levels. 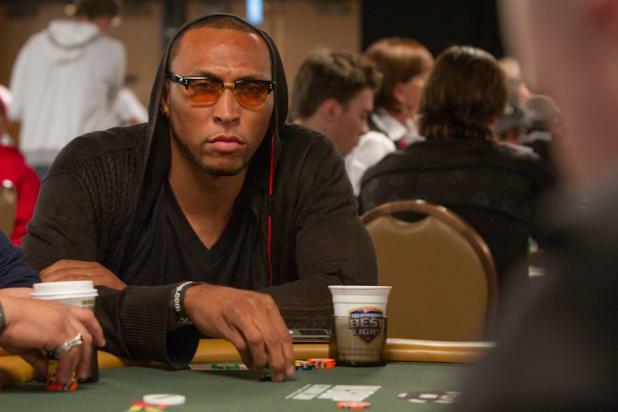 NBA player Shawn Marion is one of several sports stars who is playing in the WSOP Main Event this year. 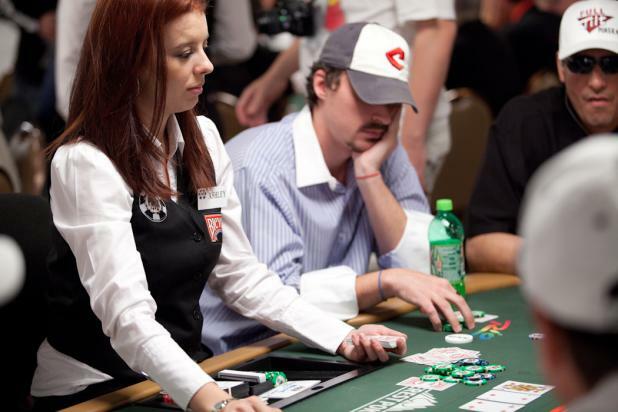 Marion plays for the Dallas Mavericks, but turns his competitive spirit toward poker on Day 1a of the WSOP Main Event. 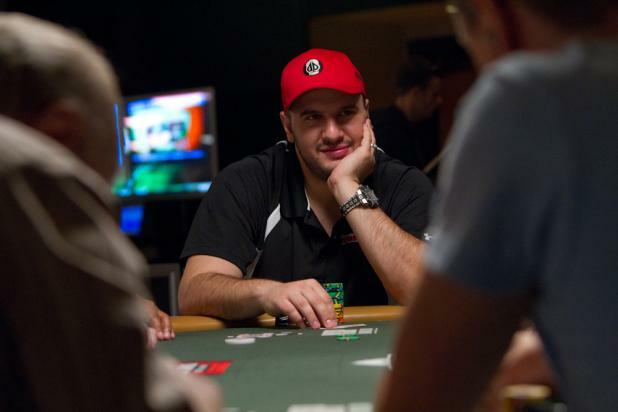 Michael "The Grinder" Mizrachi has had a strong WSOP, winning his first bracelet in Event #2 ($50,000 Poker Players Championship), making three final tables, and currently ranked fifth in the WSOP Player of the Year standings. Mizrachi started Day 1a of the WSOP Main Event strong, and was one of the first players to more than double his starting stack. 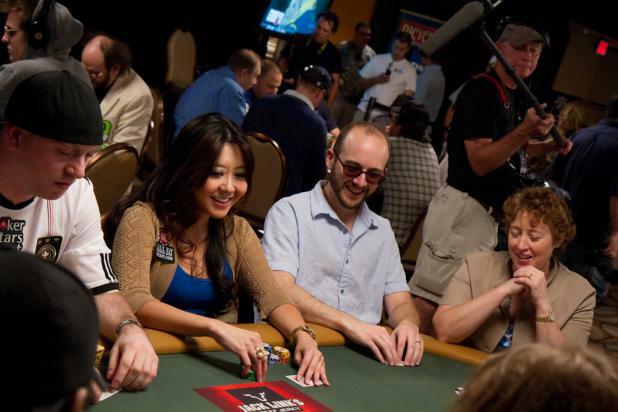 Maria Ho is picking up a lot of chips at her table, and doing it in a way where her opponents are still having fun. 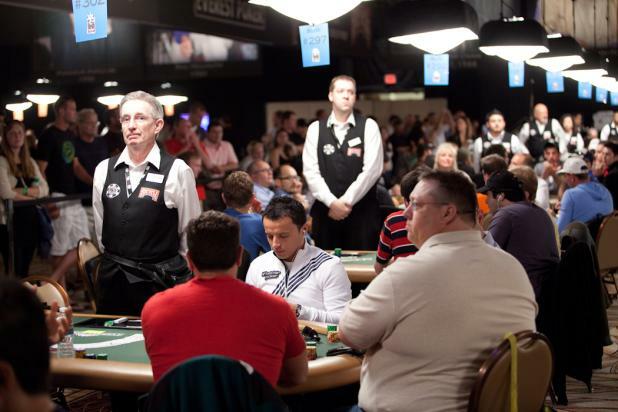 ESPN's floating camera crew shows up to cover her table often, hoping to pick up interesting action and interactions for their Day 1a episode of the WSOP Main Event.